This is either lawyer bulwarking or Microsoft realizing they had something good -- much later than they should have. Earlier this year, we heard a slew of whispers promising a late winter launch for Microsoft's Windows 8 tablets -- there was even mention of a tab-specific OS. While it's become clear that Redmond intends for its new operating system to run on multiple devices, insight into its tablet plans are still somewhat shrouded in mystery. From the looks of these gesture patents, however, it's clear MS has been eyeing a dual-screen tablet future (hello Courier). 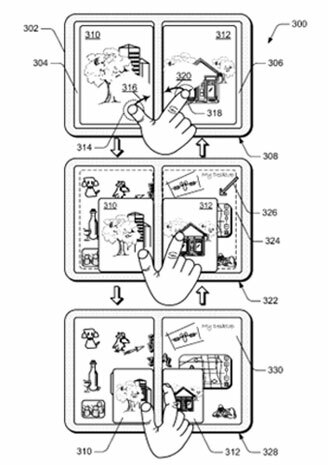 The recently published patents, not yet granted to the company, touch upon methods for off-screen input (read: bezel-based), but mainly focus on these multi-screen input options: dual tap, pinch and expand, hold and page-flip, hold and tap, and finally, bookmark hold. As you can glimpse from the image above, the patents handle simultaneous touch screen input, allowing a user the ability to swap images between screens, or even freeze a page on one side while continuing to browse on the other. By the looks of things, Sony might have some fierce competition in the multi-screen tablet market. Head to the source below to get a fuller look at these touch-based solutions. Microsoft gesture patents reveal possible dual-screen tablet focus originally appeared on Engadget on Fri, 26 Aug 2011 14:33:00 EDT. Please see our terms for use of feeds.